Preheat oven to 170°C. Grease a 6-hole (3/4 capacity) Texas muffin tin, then line bases with baking paper. Process amaretti in a food processor until fine crumbs form. Add 40g melted butter and process until larger clumps form. Press crumb mixture firmly into bases of prepared muffin holes. Refrigerate while making filling. For the filling: whisk together all the ingredients in a bowl, then set aside. Using an electric mixer, beat remaining 100g softened butter, 75g sugar, vanilla and lemon rind in a bowl until light and fluffy. Add eggs and beat until incorporated, then add flour and beat until combined. Pour mixture over crumbs in muffin tin, then spread halfway up side of holes. Spoon filling into centres - don't worry about being too precise. Bake in oven for 20 minutes or until lightly browned. Set aside in tin to cool completely (cheesecake will sink slightly on standing). Combine remaining 110g sugar and morello syrup in a small saucepan. Simmer over medium heat until reduced to about 3/4 cup and slightly syrupy. Set aside to cool completely. 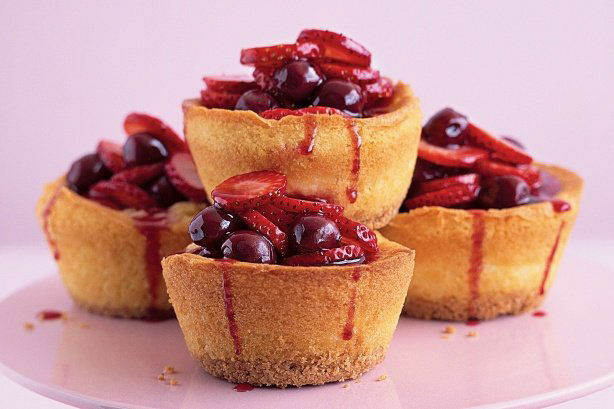 Top cheesecakes with cherries and strawberries, then drizzle with syrup to serve.